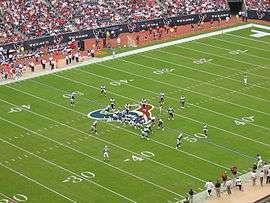 The 2005 Houston Texans season was the fourth season in franchise history. The Texans completed the season with the worst record in franchise history (a record that would later be matched in 2013). This led to the Texans obtaining the first selection in the NFL Draft for the second time since the franchise formed in 2002. The team fired head coach Dom Capers after the season; he was replaced by Denver Broncos offensive coordinator Gary Kubiak. ↑ "2005 Houston Texans draftees". Pro-Football-Reference.com. Retrieved December 12, 2014.